We are delighted to feature Andrea Scher’s Five Family Favorites. Andrea is an artist, photographer and life coach. Through her award-winning blog Superhero Journal and e-courses, Mondo Beyondo and Superhero Photo, she inspires us to find our passions and dream big. Jennifer will be notified by email and has 72 hours to claim the prize. Unclaimed prizes will be awarded to an alternate winner. Thank you to everyone who participated. A very pecial thanks to Random House for sponsoring this generous giveaway. The Children’s Book Review proudly shares this list of GREAT books all published by Random House. For your little prince or princess . 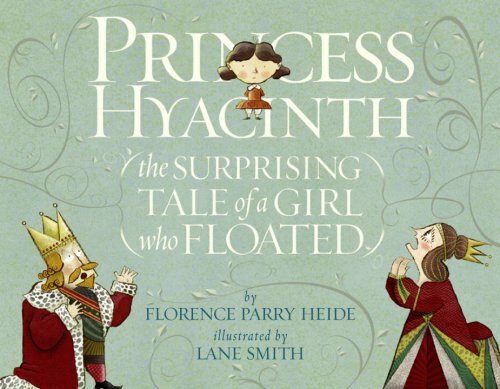 . .
A bestselling Caldecott Honor artist and a legendary author team up to brings kids Princess Hyacinth, who has one very big problem: she floats!